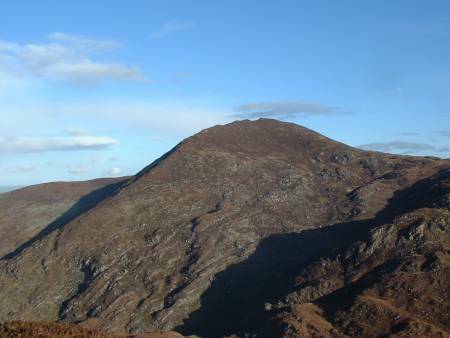 This peak has the classic hay-stack shape which is typical of mountains whose names in cruach/cruachán. Near Lough Nabroda are some crags with rhyolite formations which, though less spectacular, resemble the organ pipe formations at the Giant's Causeway. Crohane is the 198th highest place in Ireland. Crohane is the second most easterly summit in the Mangerton area. Monarch of the eastern Mangertons. Crohane is an attractive member of the "Highest 100" summit list. 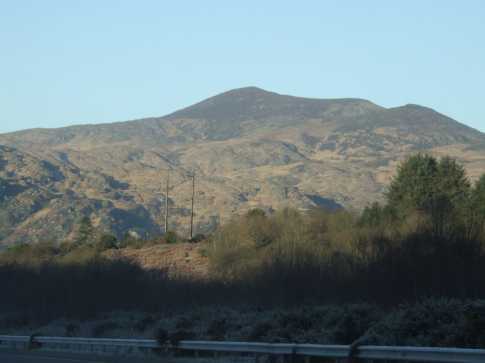 It has great views over neighbouring Lough Guitane, Killarney with its lakes and to many of the surrounding delights such as the Paps and Carran group. Start from the north at around W043 852 A which leads to a rough track up most of the summit or get to it via Crohane SW its SW spur of Crohane. The latter can be reached from the informal but traditional parking at W03678454 B which is at the end of an extremely potholed road reached from the N22. Go south along the pilgrims path into the extremely scenic vee between Bennaunmore and Crohane SW to the south end of L. Nabroda and then up Crohane SW. Shortly after driving over the county bounds from Cork to Kerry you will see the majestic spine of Crohane looming up to the left. It is not a high mountain, just 650 metres, and as such is less popular than the more tempting uplands of Mangerton, The Reeks, etc. 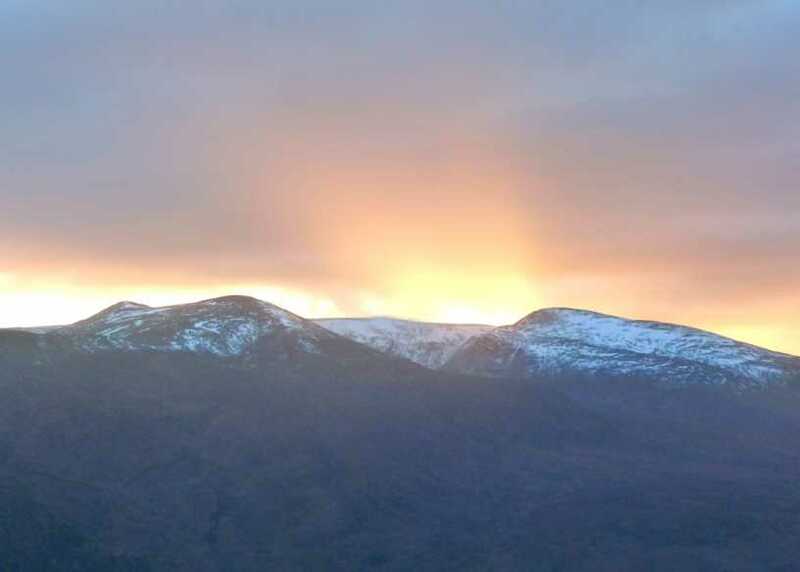 It is well worth a visit though as it affords some magnificent views westwards to Lough Guitane, Lough Leane, Killarney, The Reeks, and Mangerton; eastwards to The Paps and the Cork/Kerry border; and southwards to the country beyond Bennaunmore. As you head west to Killarney take the first turn left beyond the village of Glenflesk. 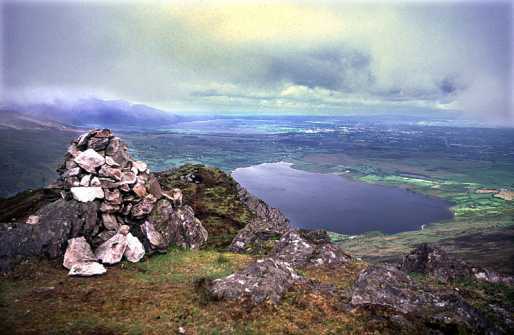 (Look for the signpost to Lough Guitane and an art gallery). As you reach the art gallery take the first turn left immediately beyond it. Drive to the end of the road until you come to a yellow farmhouse. Good manners dictate that you ask permission to park in the yard and on the couple of occasions I’ve been here I’ve not been refused. I started from a small road near the Glenflesk Art Gallery (on the Glenflesk to Muckross Road) The road passes a few farms and then winds up a long way onto the shoulder of the mountain as a good bog track. You can head straight for the top when the path runs out. At one of the farms there is a dog that likes to accompany people up the mountain (a large longhaired labrador/retriever type). His owner kept him while I passed but I met him up there later all the same.